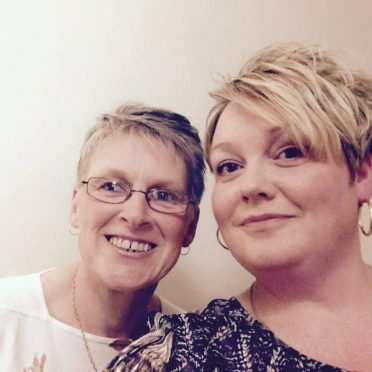 Tracey Hoy, pictured left, was close friends with Angela Spalding. The legacy of an inspirational Moray youth worker will live on, now that one of her closest friends has organised a fundraiser to allow her work to continue. Angie Spalding, from Newmill, died in a car crash on the A96 Aberdeen to Inverness road near Keith in March. The 44-year-old was a regular visitor to Elgin High School and Forres Academy through her role as a life coach with charity Quarriers. Colleagues praised her “encouraging nature” and “natural affinity” for young people. And now her close friend Tracey Hoy, from Elgin, wants to ensure Mrs Spalding’s example continues to motivate school pupils for years to come. She said: “She worked with children in first and second year helping them with all kinds of problems, whether it was problems at home, trouble settling at school or whatever. “The kids adored her. I think she just got down to their level, really engaged with them and got the best out of them. A book of condolences was opened at Elgin High School following the crash to encourage pupils to share their memories of the mentor. Tomorrow, friends and former colleague of Mrs Spalding will meet in Elgin to share stories at a coffee afternoon. Money raised from the event will be donated to Quarriers to fund the work she did in schools. Mrs Hoy, who works as a baker, was eager to use her own skills to pay tribute to her friend. She said: “I just wanted to do something in her memory, to keep it going, because she deserves it. The coffee afternoon will take place in Bishopmill Hall tomorrow from 2pm to 4pm. Entry is £3.50 for adults and £2.50 for children.